Most women love jewelry boxes. They are practical, look beautiful, and in their can add their own jewelry or other items. Such a box can also be a great gift. Today we suggest you to make a casket with your hands, using yarn and usual toothpicks. Besides, it will take quite a bit of time. 1.Take the cardboard and cut out the shape of the heart. 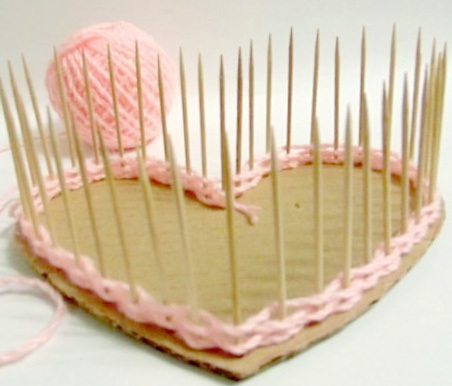 Further spread the glue on the end of toothpicks and insert toothpicks on a contour of your cardboard heart (the distance between toothpicks should be identical). 2. Take the yarn, and place it by “snake” between the toothpicks and braid so to the middle of the product. Then take the beads and put them in a circle on each toothpick. Then continue to braid the yarn until you reach the top of the workpiece. 3. 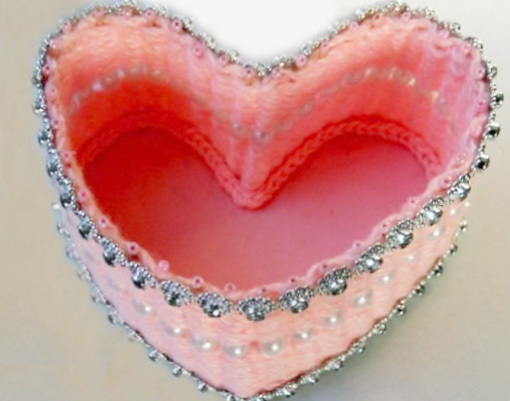 Take a piece of cloth, spread it with glue and put it on the bottom of the resulting heart. 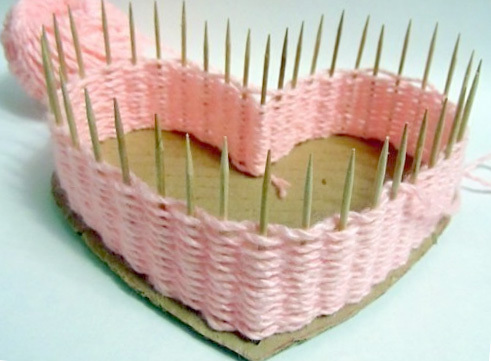 It is also possible to sew this fabric with threads to toothpicks. 4. Decorate your box from the bottom and top with a chain of rhinestones. To attach it it is possible by means of glue. Well, that’s it! Your beautiful and graceful heart-box is ready to use.